The company is in the red, as it were. A MUCH-PUBLICISED plan to put the first human colony on Mars by 2025 has been placed in administration. The Mars One Project had planned to send a group of 24 people on a one-way trip to the Red Planet and had claimed to have received 200,000 applications. Part of the plan was the film the expedition for a reality TV show. 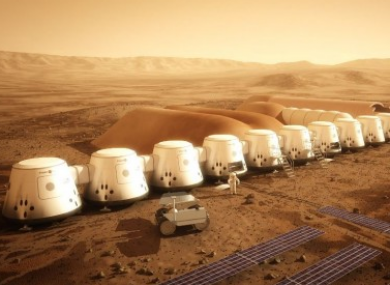 It now appears that the plan has gone bust after one of the project’s companies, Mars One Ventures, was liquidated by a Swiss court. The company has since confirmed that Mars One Ventures has been put into administration and its shares on the Frankfurt Stock Exchange have been suspended. “During the last few months, discussions have been held with a new investment company. The goal of the investor and Mars One is to achieve either a reversal of the administration or a restart based on a financial agreement with the liquidator,” the company said in a statement. The total debts of Mars One amount to CHF 1.1 million (approximately € 1 million). The investment company has expressed its intention to reach an agreement with all creditors. The company says is not giving up, however, and says it will “redirect its focus” when it leaves administration and will “seek strategic collaboration with renowned companies and organisations involved with the travel to Mars”. The ambitious plan was the subject of significant scepticism when it was announced and some volunteers who had expressed interest in it have since been critical. Irish astrophysicist Joseph Roche had applied to Mars One but has said he had done so mostly ‘out of curiosity’ with the hope of bringing ‘public attention to space science’. Roche was reportedly whittled down to be among the final thousand or so people being considered but argued that Mars One was not all it claimed to be. He said he never met anyone from the company and that only 2,761 people applied for the mission, not the 200,000 Mars One they claimed. If, as appears, the project is dead it water it could be no bad thing anyway. Five years ago a group of researchers in Massachusetts Institute of Technology (MIT) determined that if colonists made it to Mars and lived under the planned conditions, they’d last a grand total of 68 days. Email “That plan to make a colony on Mars and film it for reality TV has gone bust”. Feedback on “That plan to make a colony on Mars and film it for reality TV has gone bust”.